Samsung G400 is a 3G flip mobile phone with great style. Equipped with two impressive displays one on the inside and the other, a touchscreen on the outside, Samsung G400 offers great user experience. 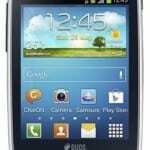 Samsung G400 has a 5-megapixel camera, HSDPA high-speed internet, USB, video calling and so on. Samsung G400 has a 2.2 inches, 256k colours, 240 x 320 pixels resolution internal TFT display. G400 has an external touchscreen 2.2 inches 256k colour TFT display with 240 x 320 pixels resolution. Capture the world around you with an impressive 5 megapixel digital camera with video and flash capability. Samsung G400’s camera has features like autofocus, image stabiliser, face detection, ensuring that you take a great picture the first time. Samsung G400 also has a second camera for video calling. Samsung G400 supports tri-band GSM (900, 1800, 1900MHz) as well as 3.5G HSDPA 2100MHz. G400 supports GPRS data services but lacks EDGE support. High-speed data and internet is supported via 3.5G HSDPA. Samsung G400 comes with a lot of functionality for a great internet experience. A WAP/XHTML and an HTML browser added to the above average screen size ensures a great browsing experience. G400 also supports features like RSS feeds, mobile blogging and google search. Connect easily to compatible devices via USB 2.0 or Bluetooth 2.0 wireless connectivity on G400. Samsung G400 has a built-in FM radio with RDS for catching up with local news and entertainment. The built-in media player in G400 supports mp3 eACC, WMA, and AAC audio; and MPEG4 video. G400 is available at all accredited Samsung product dealers in Nigeria. Buying from a Samsung, accredited dealer/distributor shop gives you a 12 months warranty on any mobile phone purchased. Samsung mobile sales hotline in Nigeria is 01-7432204.